During the Cold War, Russia was regarded by the West with a mixture of curiosity and fear. This attitude consistently found its way into Hollywood blockbusters, only to disappear following the collapse of the Soviet Union. Today, it seems the fears have returned. For all its outward appearance of political independence, it is interesting to observe just how much Hollywood sails in accord with the winds of international politics. Never, of course, was this more evident than during the Cold War - a time that the US quite openly considered the Soviet Union its most likely enemy and its film industry abounded with creepy guises of monster-Russians. The Hollywood image of Russians has, for the most part, been unsophisticated. Take the Frankenstein-like Ivan Drago in Rocky IV (1985), or the wily KGB spies cast in numerous James Bond films. Or think of the battalions of moronic Russian soldiers who die at the hands of John Rambo in Rambo-III (1988). Another school of thought held that a good way to beat an enemy was to mock him. In Spies like us (1985), for example, Chevy Chase and Dan Ackroyd stumble unhindered over the border into the USSR. They vanquish the entire Soviet army by making love to Russian missile women, desperate to surrender themselves to the dashing Western males. Following perestroika, and the start of a period of mutual disarmament, it was no longer quite as politically correct to screen Russians exclusively in the roles of monsters or idiots. This change of sentiment in Hollywood was emphasised by the character of the kind and fair Ivan Danko in Red Heat (1988) and Russian officer Nikolai Rachenko in Red Scorpion (1989). Just as frequently, Russians began to appear in Hollywood films in episodic roles as tourists, émigrés, businessmen and politicians. Then there were characters such as Russian cosmanaut Andropov in Armageddon, who - despite floating about in an incongruous fur hat and "fixing" space station equipment by hitting it with a hammer - eventually emerges the hero of the piece after rescuing the US space crew (and as a consequence, Earth). But perhaps the clearest sign of a positive change in the post-Cold War political climate was the ambitious US-European co-production Enemy at the Gates (2001). 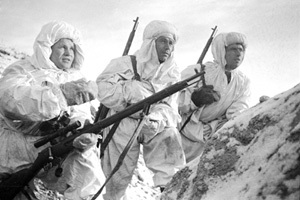 The film focuses in on the true and heroic story of Vasily Zaitsev (pictured far left), a single Russian sniper in the Battle of Stalingrad. Soon, however, the value of heroes such as Zaitsev gave way to the polar opposing brutality of the Russian mafia. One of the first such films devoting themselves to the Russian mafia was the drama Birthday Girl (2001), featuring Vincent Cassel and Mathieu Kassovitz as unconvincing Russian mobsters. The film's only endearing feature was the surprisingly good Russian spoken by Nicole Kidman. Then, in 2007, the floodgates of fear truly opened. Eastern Promises, Hitman and We Own the Night were released in rapid succession - all films notable in their gruesome portraits of the Russian criminal underworld. Some, such as We Own the Night, were well researched and plausible. Xavier Gens' Hitman, on the other hand, could only be described as a trash thriller, featuring as it does a Russian President who - together with an unlikely named brother, Udre - supplies drugs and prostitutes to the West. One thing is clear... Russians are once again feared in Hollywood. Perhaps some Russians will take comfort in the truism that behind fear lies respect.